I just opened the new-style cabin curtains kit I ordered from Catalina Direct over the winter, to install them today. 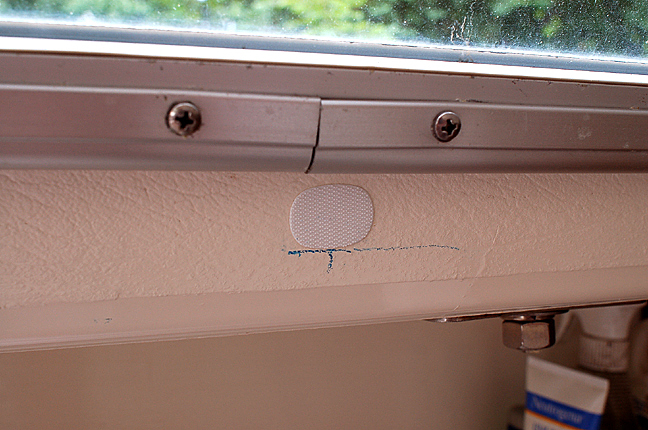 Curtains, fasteners, white disk do-hickeys, but no explanation how to install them or where, even how it's supposed to look when completed. 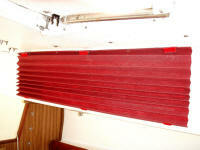 Mounting the top of the curtain is self-explanatory. 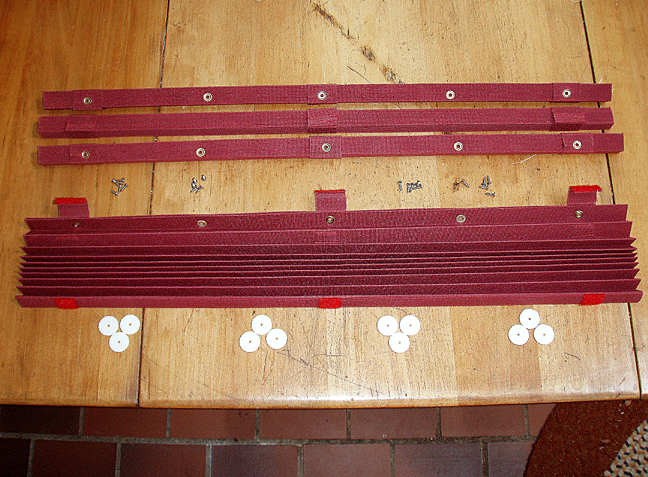 Five grommeted holes, twenty self-tapping screws, four curtains -- one screw for each hole. So far, so good . . . The curtain seems to work -- now all that remains is to figure a way to attach them at the bottom to keep the curtains down. 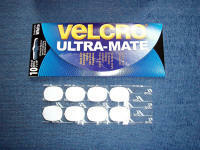 Three strips of velcro strap; three white nylon do-hickey disks per curtain that seem designed to hook velcro. Nothing to fasten them with, though. Each has a hole in its center. The dozen screws I must need seem to be missing in my package from Catalina Direct. A run down to the local West Marine store got me a dozen 1/2" #6 flat-head self-tapping screws at 9¢ each -- no charge, not worth enough for them to even ring it up on their cash register. 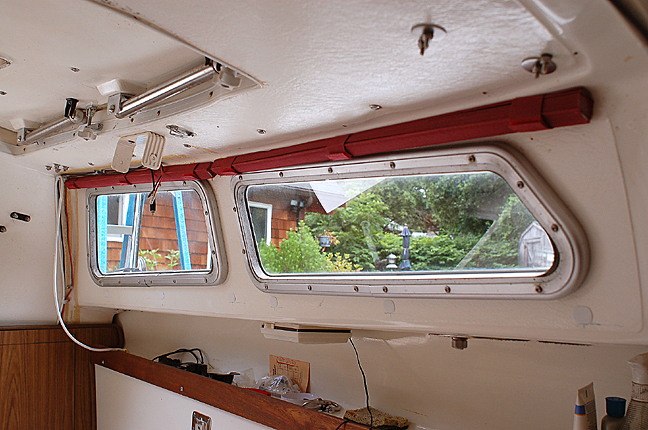 Back at the boat, I marked the holes then drilled one. 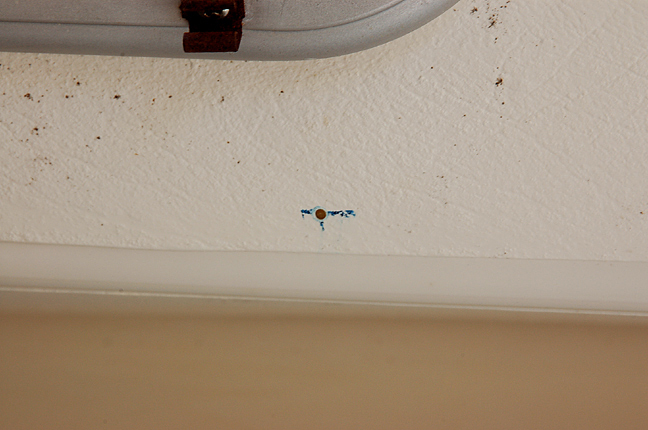 Uh oh, the drill bit popped right through -- light came in the hole I'd just drilled! 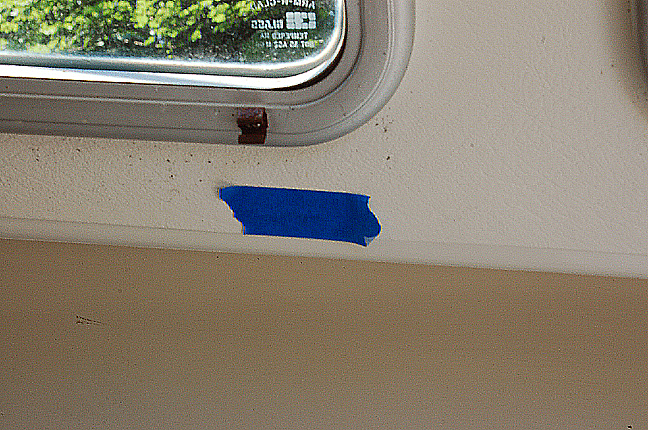 I drilled right through the fiberglass cabin trunk -- there's nothing there but maybe a 1/4" of fiberglass, damn. That's it, I'm done. I filled the needless hole with West System epoxy and called it a day, disgusted. Apparently those holes in the do-hickey disks' centers aren't meant for screws after all -- who knows what they're for? Looks like something will have to be cemented on in that area to hold the curtains down. 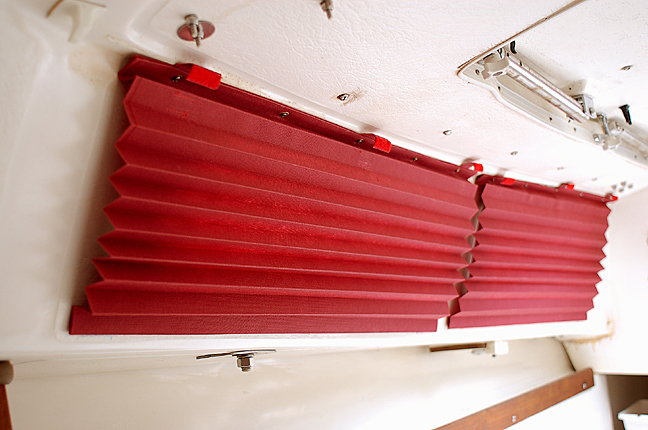 The curtains hanging loose beneath the velcro tabs, behind (starboard side). 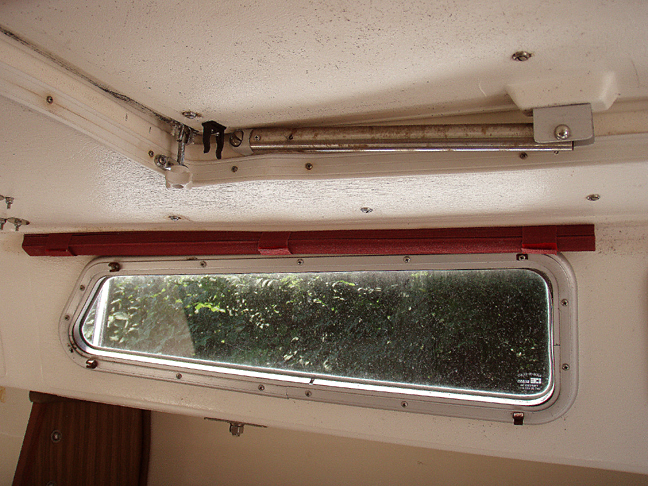 The curtains fastened open, the tabs beneath the windows on the cabin trunk (port side). 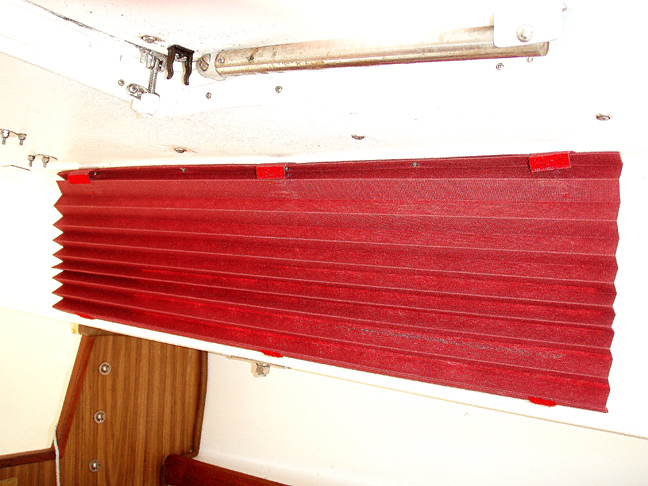 The curtains fastened closed on the new velcro tabs (starboard side). They seem to work, but we'll see how long those tabs stick. 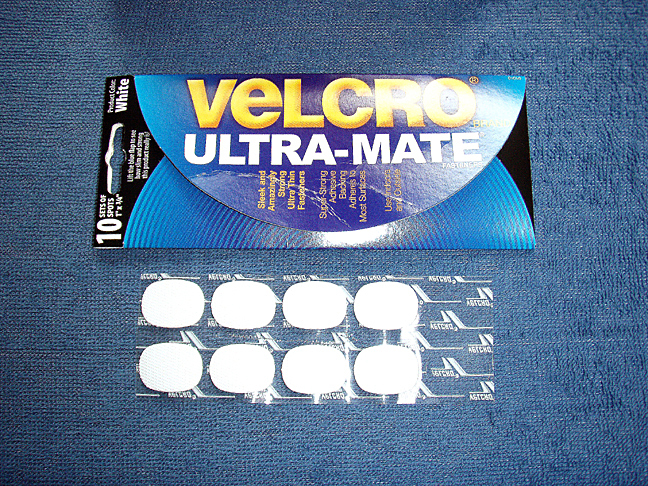 The tabs come ten to a pack, so I've got eight left over from the second package as replacements if they don't hold.